NOTE: Updated with pictures of the finished project on 6/22/11. See far below. 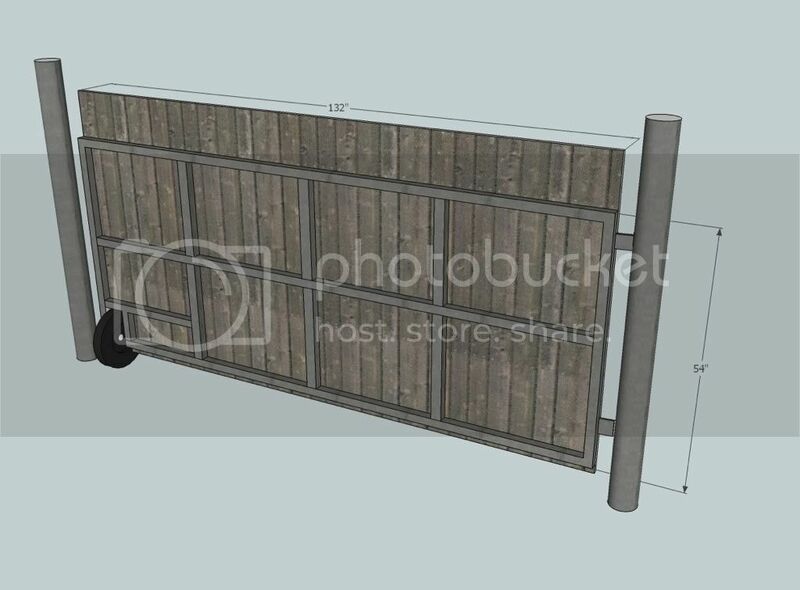 I am (re)building an 11 ft. gate for the driveway. I plan to re-use the 1yr old cedar fence boards that are already on it since they match the rest of the fence. 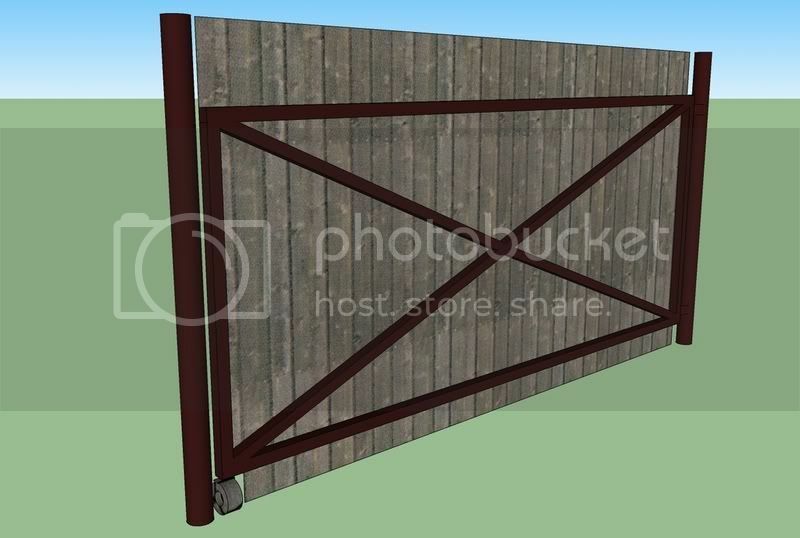 I do not want a double-hinged gate split in the middle with two separate pivot points, but would rather have a single, wide gate with one pivot point. Here is my first design of it. What do you think? I was thinking about using 2" square tubing 0.125" wall. I do not mind a little "overkill". The wheel will support the weight on the free/un-hinged end. Suggestions, critiques, ideas, etc, please. Last edited by Lindley; 06-22-2011, 10:17 PM. The path/arc where the wheel rides needs to perfectly level with the hinged post or the wheel will leave the ground or dig in to the ground. Most gates I have seen have a diagonal brace from the top corner hinge side to the bottom corner opposite side. If the wheel is always in contact with the ground that shouldn't be needed. Last edited by MMW; 06-12-2011, 06:11 AM. Looks like it should do just fine. The only thing I would change, is to extend the verticle piece on the hinged side of the wheel, straight up to the next horizontal piece. But keep the short horizontal piece above the wheel. The horizontal piece that extends over to the next verticle piece could be turned upward to serve this purpose, instead of where you have it now. Otherwise it should do OK, as long as, has been said, the wheel stays in constant contact with the ground through out the arc swing of the gate. Also you might want to consider installing a gate catch at the full open position of the gate to hold it open so the wind doesn't try to slam the gate shut when you want it to stay open. That's something that would happen to me just as I was trying to drive thru. It would hit the side of my truck or car denting and or scratching it. Just wondering if there is a way to add suspension (springs) to the wheel or hinges or both to compensate for any variance in the road surface? That sounds like a viable option too, if there is any variation in ground level to consider. The wheel could be set back to the inside of the gate, on a suspension device, where it would not be seen from the outside when closed. Or set back on a ridgid support if it's a flat level surface so it is still hidden when closed. You didn't mention what kind of wheel you will use but a solid wheel may be preferrable too, over a pnuematic tire that may get low on pressure or go flat. Here is a spin on it with a diagonal brace installed. I like the idea of the hidden or offset wheel, however, the shi**y gate I have now has offset wheels. The non-axial weight of the gate tends to make it lean forward, therefore, I decided the next wheel will be in line with the hinge supports. Also, my driveway is narrow and I don't want an offset wheel protruding out too much into the driveway. I have hit the existing wheels many times while backing in the boat. Great idea about having an additional pole to lock the gate in place. I have had the wind swing the gate into the boat too! Lastly, I am liking the suspension idea as well. Come to think of it, the drive was poured in stages over a period of years (first, just wheel paths, then they filled in the space in between), so it is definitely not a perfectly level surface. I guess the flexibility of the current gates allows the wheels to stay in contact with the ground, but I think this gate will be too rigid for that (hopefully). What do you think about the diagonal vs horizontal middle support? Also, what do you think about my choice of material? Last edited by Lindley; 06-12-2011, 08:28 AM. You can make some hinges with 1/2" round bar inside some 1/2" sc. 40 pipe. 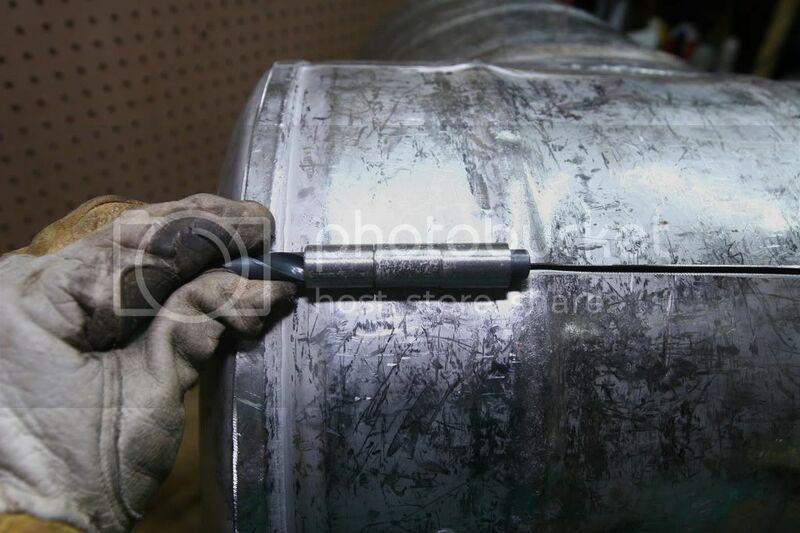 Send a drill bit through the pipe to round the inside. Kings metals also sells premade good quality uphill hinges. Install the hinges with maybe 1/2" space at top and bottom of the pins. That way the gate can go up or down if it needs to. I built the exact gate, I used aluminum square tube 2x2 strong but just the tubing alone weighs nothing and with x bracing very strong. Also at the wheel side I got a wheel from a friend that is used on stanging so it had a 10 inch post attached to it that slid into the staging frame. Well I got a piece of pipe 12 inches long that fit over the wheel post and in the square fench tube, put it in the sq. tube of the the gate end(noneed to weld it went to home depo and bought a mild spring and put it on the wheel shaft. So if there is any uneven in the ground the spring took care of it. works great. Kings metals also sells premade good quality uphill hinges. $127!?!? I like your 1/2" round sock idea better. I did stainless steel hinges similar to that method recently on a smoker I am making. Last edited by Lindley; 06-12-2011, 10:47 AM. Sounds nice. Do you have any pictures you could share? Here is an "X" design. I think this is the best design. I tried doing something a little different, but this is hard to improve upon, IMO. What do you guys think? Thanks everyone for all of the suggestions! Last edited by Lindley; 06-12-2011, 11:18 AM. The 2X2X1/8 tubing should be plenty stout. Any pattern you have will work OK, with the slight change I mentioned on the first one. The X pattern one would probably be best, as you said "hard to improve on it". Those $127.00 hinges are for someone that doesn't know how to weld, or who welds poorly. If you fit the latter description, get someone else to buid the whole gate. You most likely don't fall in that catagory, so build your own in the same design and $ave $ome buck$. 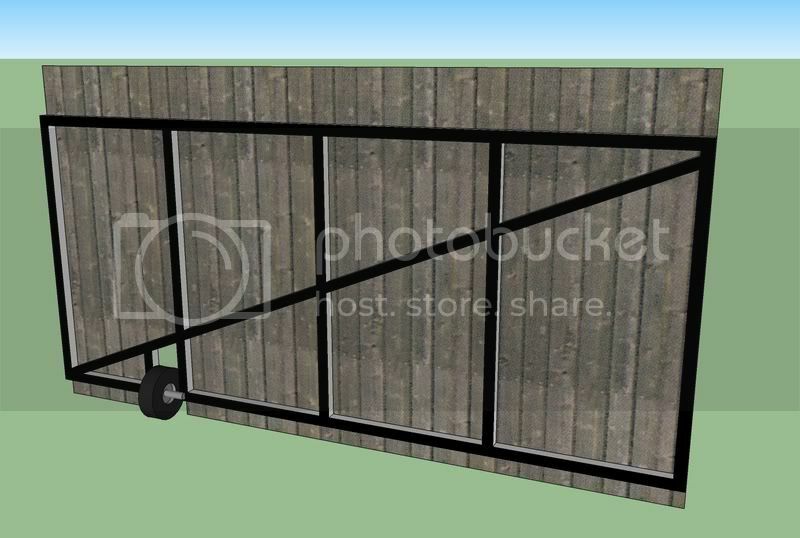 Those you showed for that smoker should do the trick, just scale up the dimensions to suit the weight capacity. By the way where are the pix of that smoker you said your working on? That can be a whole other thread right there. How come we're just finding out about it? Not ashamed of it, are you? No matter which design you settle on I would put a horizontal tube all the way accross halfway between top & bottom. Not for strength but so the boards have something to screw to in the middle to prevent warping. By the way where are the pix of that smoker you said your working on? That can be a whole other thread right there. How come we're just finding out about it? Not ashamed of it, are you? All in due time, my friend! Haha! I'd like to show it from start to finish. I am in a bind right now trying to get some 1" x 1/8" stainless flat strap. Can't seem to get my hands on any and the local S.S. supplier isn't comfortable with shearing that width because of warpage. Whatever. I'm still on the prowl. At any rate, thank you for the suggestions. ... I would put a horizontal tube all the way accross halfway between top & bottom. Thanks for the thought. That's not a bad idea. I like the wheel on the very end of the gate so it does not get much attention.